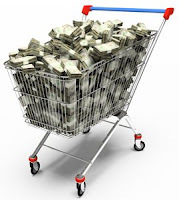 Frugal & Fabulous: Newbie Tip: Couponing at the Grocery Store! Newbie Tip: Couponing at the Grocery Store! Like many 'extreme couponers', I started couponing by learning how to work the Extra Care Buck system at CVS. Once I got the hang of it, I got to the point where I was getting all of my health and beauty items for free but was having a hard time branching out to get grocery store deals. Here are three resources that may help you save more money at the grocery store! Hotcouponworld.com -Where would we be without Hot Coupon World?! This site is the ultimate resource for all things related to couponing! They have a coupon database and forums for anything you can think of; you'll find printable coupons, drugstore deals, and of course, grocery store deals ! Just search for your store in the forum. Many members list deals every week that will match your circular. Definitely worth checking out before heading to the store! The Grocery Gathering at Becentsable.net! This is a FREE coupon matching site that lists deals at both grocery and drug stores. They also provide circular previews for many stores. All of the matches are provided by blogs/web sites that link up to the site each week. (You may have noticed that I post Stop and Shop and Big Y deals and coupon match ups for this site.) When I first started couponing I found it difficult to find deals for my local grocery stores and that is why I try my best to share my deals with others. How do you score your grocery store deals? Do any of these methods work for you? Do you use another site or method? Let me know! Thanks for the tips. I love couponing but I have yet to join any coupon clubs. thanks for the tips! I'm still having a hard time getting good deals at grocery stores. I started off at Wags, and nothing really seems that great since no grocery stores around here double. But I'm sure I will find better deals more and more soon enough. Great info!! thanks for putting that together! Im using grocery game right now. I started with it and it's great for beginners but Im starting to lose interest. My problem with them is that the list doesn't come out till late Sunday and they have been missing a lot of the CAT deals for Shaws. I learn more by seeing other's scenarios then just a list of items. They even missed last week's RR for the Bayer monitor for Wags!